Wondering where to put all those presents? No more space under the tree? Well, what about the good old Christmas stocking? We've picked the sturdiest and prettiest options – not only will they hold all your pressies, but they also will look amazing as part of your Christmas home decorating scheme. We've also thrown in a couple of Christmas sacks for good measure – in case you've gone a bit crazy on presents this year, and no stocking is big enough to accommodate all you've bought. And if you're wondering what to fill your stockings with, we have the best Christmas stocking fillers. If you're going for traditional red Christmas stockings, why not add a personalised touch with your loved ones' initials? The Monogrammed Christmas Stockings from The Handmade Christmas Co. are made from glitter hessian – both traditional and glamorous. Going for a Scandi decorating scheme this Christmas? Now there is a perfect Christmas stocking to match – the Grey Christmas Stocking by Linen Hearts, available at Etsy. If you prefer something textured and natural-looking, hessian is your best bet. These Artisan Stockings by Minna's Room are 100 per cent hessian. Available from Not On The High Street. For those who want a more sustainable Christmas, organic cotton is a great choice. It helps that these Organic Stockings by Meri Meri are so easy on the eye. Available from Smallable. If you like this idea, see our tips for having an eco Christmas and our eco gift guide. Want an Instagram-worthy Christmas stocking that's both practical and uber-stylish? The Holly & Berry Christmas Stocking by Sophie Allport fits the bill. Speaking of stylish stockings, why pick plain, when you can have appliqué and embroidery? Display them proudly anywhere in the house – Christmas decorating sorted. We love the hand-embroidered Christmas Stockings from Jan Constantine – you'll want to keep them for next year, too. Children will love this cute and fun Penguin stocking from B&Q – it's a bargain, too, at only £5. There are tons of Christmas tree decorations that kids will love in our guide, plus don't miss our gifts for girls and pressies for boys, too. Presents won't fit in a stocking? Not to worry – just choose a handsome Christmas sack instead. Our pick is the substantial Personalised Chunky Knit Santa Sack by Lauren Aston designs, available from Not On The High Street. Don't like reusing the same Christmas stockings/sacks year after year? Pick a chic paper version; it'll look contemporary and cool, and is easy to recycle after Christmas. Our favourite is the Custom Xmas Sack by Firastudio, available from Etsy. If, on the other hand, you love the idea of reusing – and maybe even repurposing – your Christmas sacks, choose hessian as the most durable option. They have a rustic charm to them, too, and will fit into any Christmas decorating scheme. 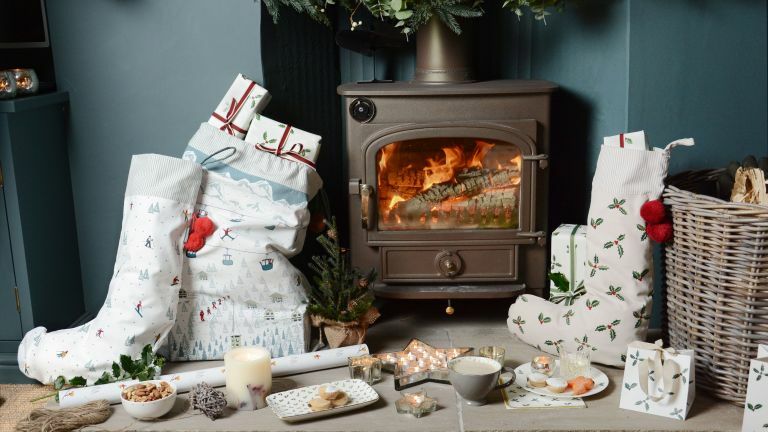 We like the Vintage Christmas Sack by Minna's Room, available at Not On The High Street. Want a change from the sea of red, white and green? The animal print stockings by Jan Constantine are playful and fun, and don't worry, they're made from velvet. Available at Amara. Everyone is excited to see what's in their Christmas stocking, but children especially so. Make opening their Christmas pressies that extra bit more magical with these super-cute Dress Up Animal Felt Christmas Stockings by Clara and Macy, available at Not On The High Street. You really can't go wrong with grey, an on-trend colour that works with any decorating style. The Personalised Snowflake Christmas Stocking from Not On The High Street is the perfect choice for the style-conscious.